Sustainable fashion symposium: well done to the 1st-year students! As part of the Project Management course, the 1st-year Fashion Business (Hons) BA students worked hard to organise this symposium about sustainable fashion. “Our focus was to encourage sustainability to the next generation of fashion professionals. Together we empower to take action for a more sustainable fashion industry”, says Phillip Roessen, project manager. “I was one of the two project managers. I really enjoyed the experience to work in a team and realise a real event. Furthermore, I am really interested in sustainability and I’m glad that we were able to inspire our design students to work in a more sustainable way”, says Katja Gerber, project manager. 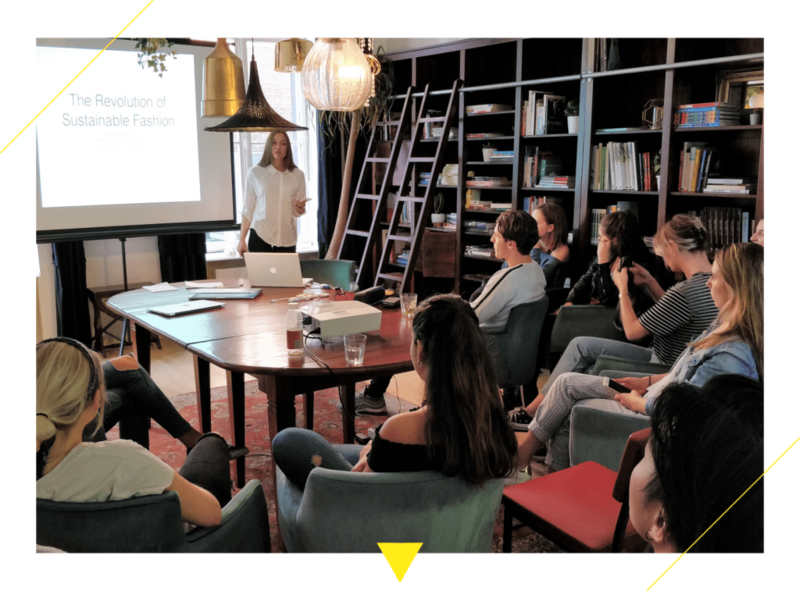 Marijne Weegemans gave us an overview on how sustainability developed in the fashion industry, becoming one of the most important aspects to consider for brands. Lisa Windels focused on sustainable materials and presented alternative materials, such as leather made of mushrooms. Last but not least, Liana Weber talked about new business models by providing case studies of companies with sustainability in their DNA. “The Dutch Sustainable Fashion Week is a great way to get inspired and to inform yourself on how to become more sustainable. Their website gives great facts on the fashion world and gives interesting tips on how to get started. The fashion library Lena (located in Amsterdam) is a good idea if you want to keep switching up your closet and not have to throw away anything and MUD Jeans is an international success that allows you to get jeans by subscription and switch them for a new pair every year””, explains Liana. “Organising the design2sustain symposium was a great way for the students to implement whay the learned during the Project Management course and to learn more about sustainable fashion. Every student was assigned a specific role, which gave each of them the opportunity to participate and develop their skills”, says Rosie Martinez, lecturer of the course.